NaPoWriMo, Day 7. I’m off prompt today. So this post does not really involve musing, unless you want to think about how wonderful bread is–both to bake and to eat. 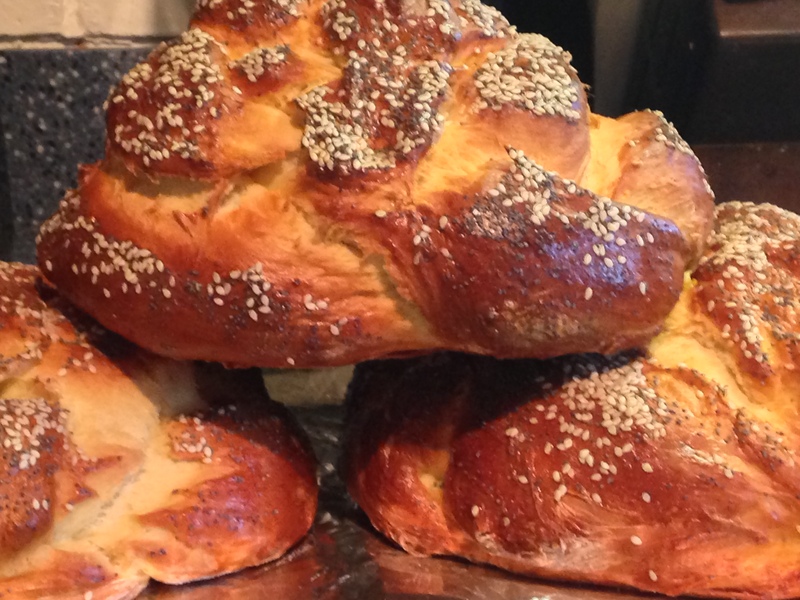 I made my Aunt Sima’s famous challah recipe. It is famous because I’ve written about it before. Also, it’s delicious. It’s a great recipe, and if by chance you were to decide to bake two loaves (two batches) before 6 AM when you haven’t even finished your coffee because you want to make sure they get done before your daughter and her wife arrive for your other daughter’s wedding and you still have to clean the house, go to the gym, and work on your page proofs—and well, you might have—perhaps—added too much water to the recipe because it seemed then to need more flour than usual, but you’re not positive if you actually did add too much water.. . .well, IF this ever happened to you, rest assured that the bread will still come out great. AND, it looked like this. I used gel food dye. 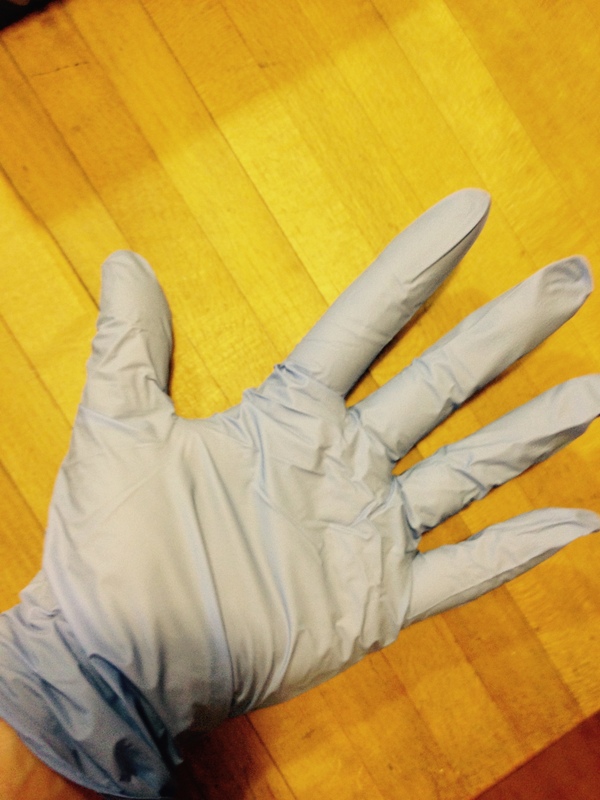 Important tip—wear gloves—well, unless you want your hands to be stained with a variety of colors. But if you want rainbow hands to go with a rainbow themed event? Fine. I will not stand in the way of your art. Otherwise, wear gloves. My husband bought me a huge box of these gloves, so now I can make 37 more rainbow challahs before I need to buy more gloves. Instead of dividing the dough into 3 sections, as usual with this recipe, I divided it into 6. I know you can see only 5 balls, but there were 6! Then I colored each a different color. I couldn’t figure out how to mix in the dye at first, and that took some time. I finally decided to use plastic knives to scoop out a bit of dye and added it to a ball of dough. 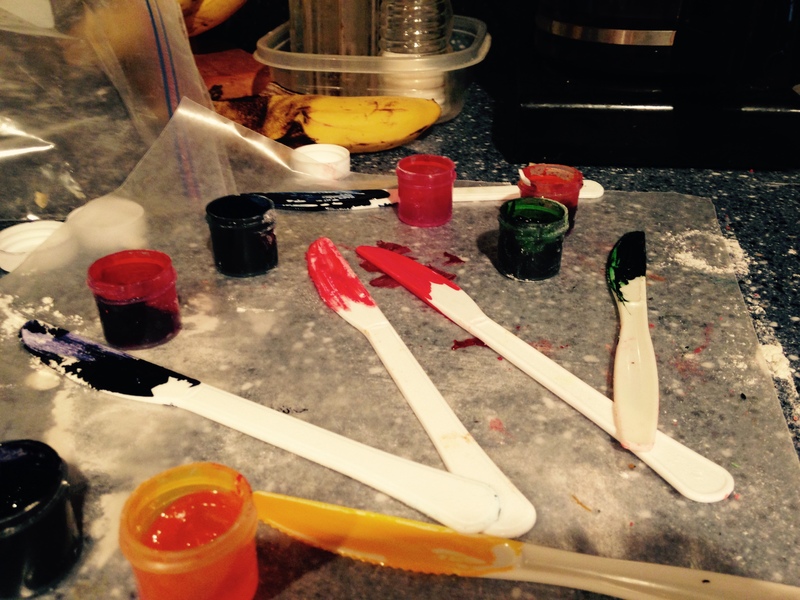 I then kneaded each ball to distribute the dye. 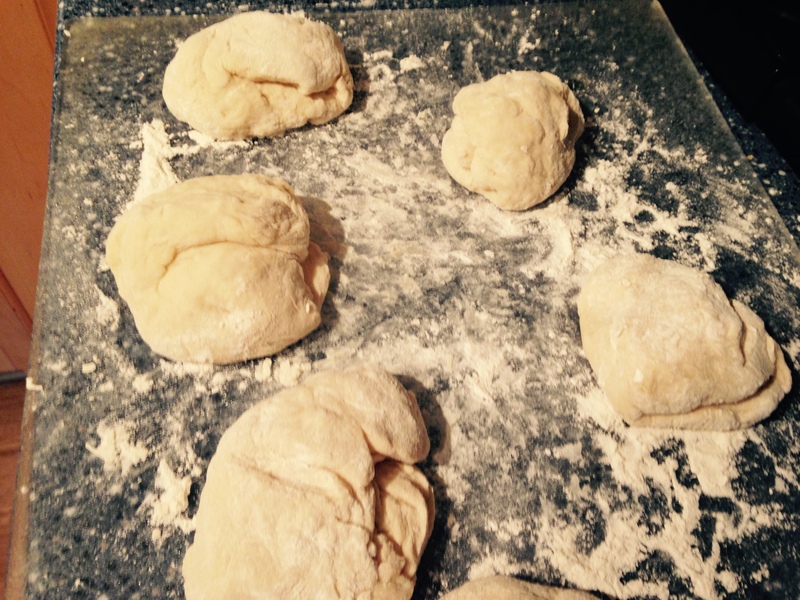 Each dough ball was well kneaded by the time I got through adding dye and kneading it. Very well kneaded. The most well kneaded dough I’ve ever made. You will need to use more dye for the darker colors. I then rolled each ball into a rope and braided the 6 ropes. It took so long to add dye and knead each ball that I didn’t really do much of a second rising after I braided the dough. Maybe 10 minutes or so. Then I brushed the braided loaf with the egg yolk glaze and baked. Totally NOT Gluten Free! Stunning, colorful, and delicious! –Mix above ingredients, allow to stand and dissolve until frothy. –Beat above ingredients and add to yeast mixture. Add enough flour for a stiff dough. [Start with 2 cups and then go from there.] Knead and place in a greased bowl. Cover with a clean dish towel or plastic wrap. Let rise until doubled (about 1 hr. to 1 ½ hours). Knead again. Take off 1/3, if you want a “topknot.” Divide the rest of the dough into three sections, then braid the 1/3 and set on top. Or divide dough into 6 sections and braid. 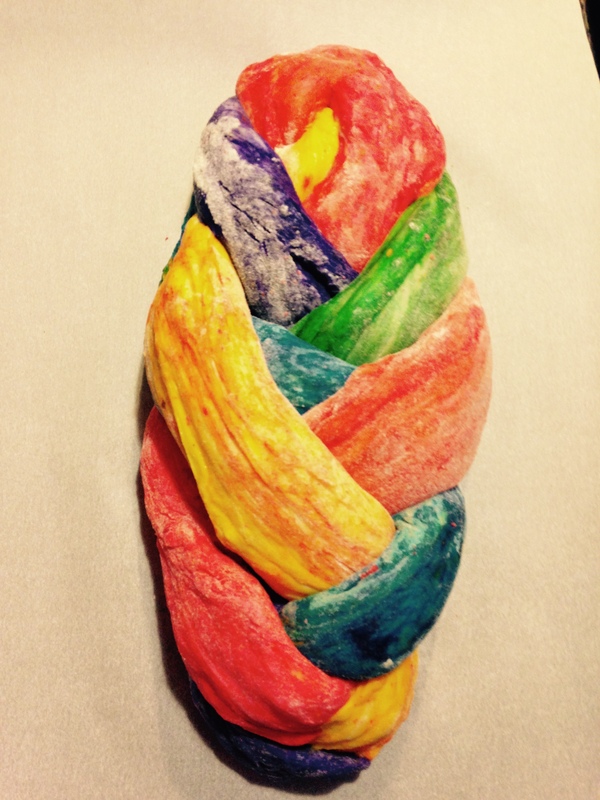 (For a round challah, you can braid and then connect the ends so it forms a circle.) Let rise briefly on a greased or parchment paper lined cookie sheet. Coat with a mixture of 1 egg yolk and 1 Tbsp. milk. Sprinkle with poppy and sesame seeds. I usually use both, but didn’t do either for the rainbow version. Bake at 350° until golden brown. You can thump the bottom and it should sound hollow if it’s done. 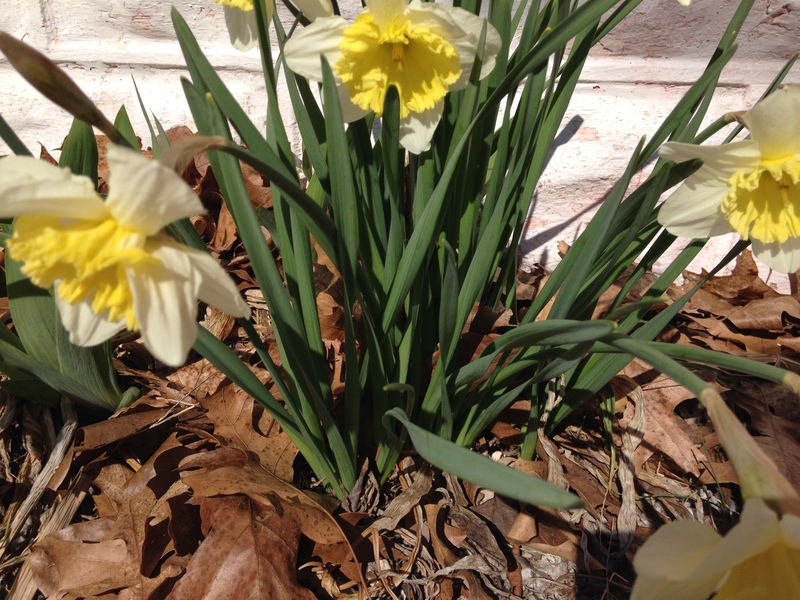 The expected blizzard of 2015 did not take place in South Jersey this week. Weather forecasters kept changing the numbers. The amount of snow expected kept changing—we’re going to get a foot of snow; we’re going to get 6 to 12 inches; we’re going to get somewhere between 2 inches and 13 inches. The timing for this anticipated snowstorm kept changing, as well. First we were going to get a storm with 1 to 3 inches of snow on Monday morning, then later in the day and into the next day we’d get the “real” storm. Based on the forecast, my husband’s school, as well as all of the schools in the area, made plans the night before to close. The governor of New Jersey declared a state of emergency, and people were not supposed to drive. 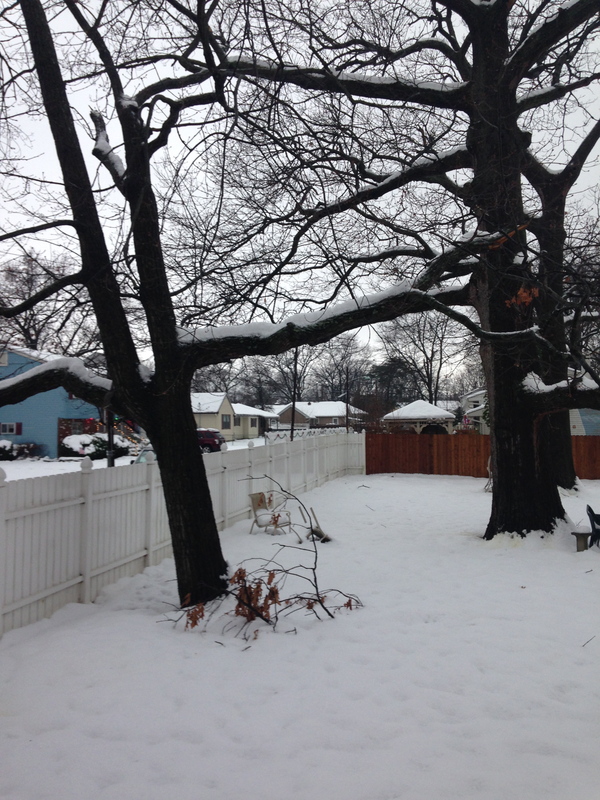 When I woke up early Tuesday morning, I discovered we had received less than an inch of snow. So much for the snowstorm. But everything was quiet and still, and we had a snow day. I thought about real snowstorms we had had. There was one huge blizzard when our daughters were small, and we had about two feet of snow, and more where the snow drifted. Our daughters’ school was closed for the week, and so was my husband’s. We were cocooned inside our house, and I baked lots of treats—something different every day. It was somehow relaxing knowing that we could not go anywhere. 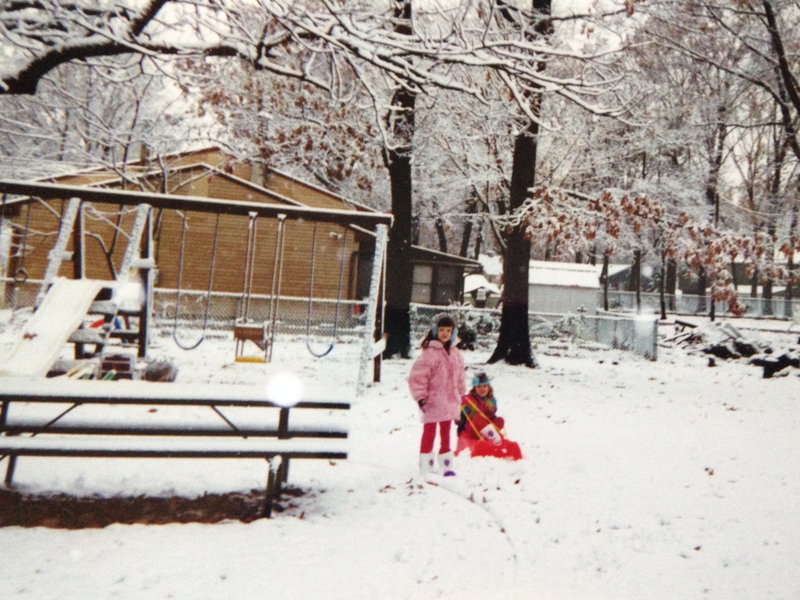 My daughters playing in the snow many years ago. On Tuesday, though the roads were fine later in the day, my husband and I treated the day as a “snow day.” He did some schoolwork, and I did a bit of work, too. But we also relaxed. We watched four episodes of “Fringe” on Netflix throughout the day. I read; he napped (have I mentioned that my husband is a champion napper?). Of course, on snow days, one must cook and bake. Well, one must if you’re me. I had already made a pot of red lentil soup and homemade black bread, so I baked an apple cake. I know for some the unnecessary snow day was a burden or a day of missed income, and I know others north of us really did have a snowstorm, but for me, the day was an excuse to slow down and relax, to not go anywhere, or follow a schedule—well, except for feeding the cats at their usual time. We will probably get more snow at some point before the winter turns to spring, but I’m eagerly waiting for sprouts of green to appear on lawns and trees and to feel the warm sunshine upon my face and shoulders. In the meantime, I’ll delight in happiness when it comes, and appreciate unexpected pleasures. Sometimes life’s storms never materialize. Sometimes they’re followed by periods of calm. And sometimes it’s fine to just take the time to watch Netflix and bake goodies. The word “garden” popped randomly into my head this morning, followed by this song, “Make Our Garden Grow,” the finale from Leonard Bernstein’s operetta, Candide, based on Voltaire’s novella. I love this song, and it’s possible I listened to it several times today. Here’s “Make Our Garden Grow” from the PBS version that was a favorite in our house. Sometimes there’s a snowstorm, and sometimes you get an unexpected gift of a day. Sometimes you see snow, dream of gardens, and find happiness where you can. And sometimes you bake a loaf of bread. And so it’s done. My little girl, my first born, is now a married woman. I am still teary-eyed, but happy and content to know my daughter is married to the woman she loves. She and her lovely bride were married this past Sunday in a beautiful, tender, loving, and funny ceremony at the Adventure Aquarium in Camden, NJ. The brides were beautiful—my daughter wore my wedding gown, now known as “our gown.” The weather was perfect, and the aquarium setting was striking. Shark tanks inside and the Delaware River and Philadelphia skyline outside—what could top that? Only the love in their eyes as they gazed at each other. In the days leading up to the ceremony–which of course were filled with last minute chores to do and items to pick up, drop off, and assemble—we all tried to find ways to relax and de-stress. On Friday night, my daughters and soon-to-be daughter-in-law and I went for a long walk through our town and along the river. My husband then joined us for a family movie night as we watched “Frozen,” a movie none of us except my younger daughter had seen. The tears and laughter during the movie were a prelude for the wedding symphony to come. Of course, over the days leading up to the wedding we ate and ate. 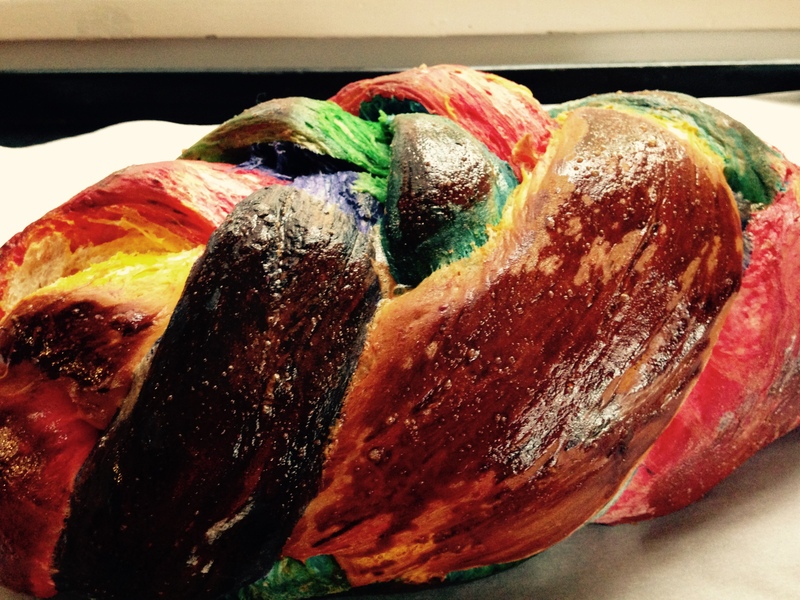 On the Thursday before the wedding, I baked the brides-to-be a pre-wedding challah. We tore chunks of it off to eat with cheese, as we sat outside at a local winery on a beautiful summer night. Bread and wine—looking back it seems symbolic and perfect for a pre-wedding feast. Plus, I’m all for eating bread for dinner. Food is often an important feature of holidays and special occasions. In my family, food is always a feature, a necessary and expected part of such celebrations–if not the most important part. Why should weddings be any different? I baked many batches of cookies to give to those who attended the rehearsal dinner. After all, I wouldn’t want anyone to get hungry in the middle of the night! Tonight I’d like to discuss what’s really important in marriage. That, of course, is food. When two people marry, they bring their pasts with them—and this often includes family quirks and traditions. They attempt to meld or accommodate different ideas about proper meals—when and what to eat. Vegetarians and meat-eaters; picky eaters and adventurous eaters; those who like formal dinners and those who prefer casual dining—it can be a challenge to make these differences work. Many of our family traditions involve gathering around a dinner table. Food is a source of gustatory delight and memories—the strawberry shortcake dinners we ate after picking strawberries, for example– but it also a source of comfort and tradition. During holidays we eat foods that represent particular thoughts or events. We savor the round challah at Rosh Hashanah (made from my Aunt Sima’s world famous recipe) and enjoy it with honey for a sweet year; we devour way too many fried latkes and donuts at Hanukkah in remembrance of the oil in the temple; and we eat the matzoh, charoset, and other foods at our Passover meal that symbolize the ancient story of the Jews fleeing Egypt and slavery. When Megan and Sheryl were growing up, I baked lots of cookies, including Doug’s favorites, which became known as Daddy Cookies, and my favorite, which became known as Mommy Cookies. 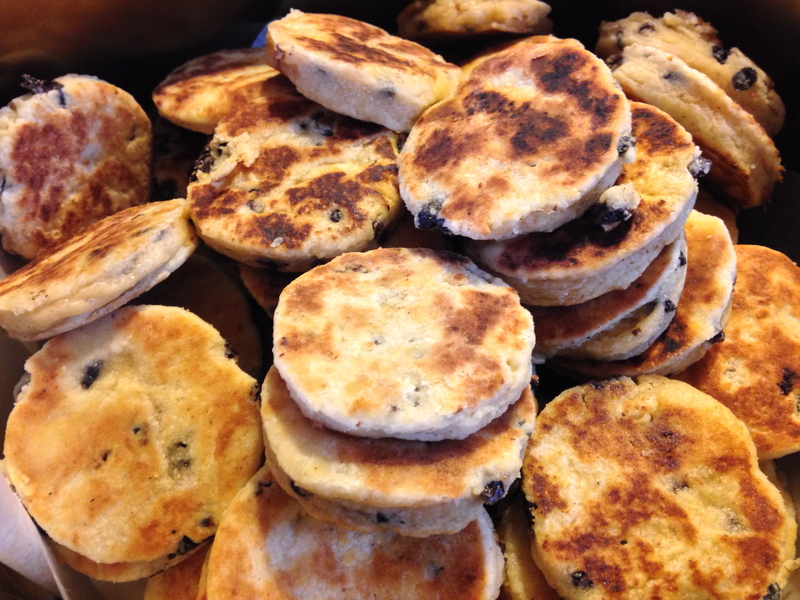 Daddy Cookies are Welsh Cookies, a type of tea biscuit cooked on a griddle. They are popular in the Scranton, PA. area, and I got the recipe from his grandmother. 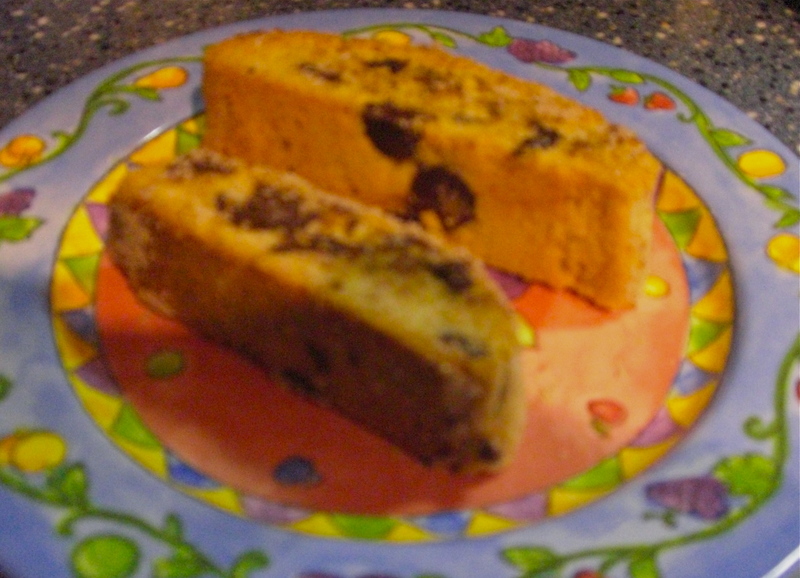 Mommy Cookies are my version of Mandelbrot, which I describe as Jewish biscotti. These cookies are totally different—in shape, texture, and ingredients. Yet, they are both sweet and delicious, and Megan and Sheryl grew up eating both types. Doug and I are very different, but even though we prefer different types of cookies, we can appreciate the other’s favorite. We share many mutual beliefs, interests, activities, and love. Megan and Clare are also very different people with different backgrounds and tastes who have come together because of their love for one another and their shared interests–including food. Megan and Clare –it makes my heart sing to see you together. I am so glad you found each other and that you’ve chosen to share your lives together, and that we here are fortunate to be able to share in your celebration. Doug and I are pleased that we can gather together with all of you tonight over a fine meal and share food, love, and traditions. We’ve prepared a little gift bag of symbolic goodies for each of you, which includes Mommy Cookies and Daddy cookies. There are also some sweet and salty fish-shaped treats. Fish, obviously, symbolize the aquarium site for tomorrow’s nuptials. Sweet and salty represents the happiness and tears that come in marriage. Please raise your glass now and join me in toasting my daughter and my almost daughter-in-law. To Megan and Clare—may you enjoy many delicious meals together. May your lives be filled with sweetness–and may you cry only tears of happiness. I love you. L’Chaim! As twenty-somethings, my husband and I lived for a few years in a wonderfully peculiar first-floor apartment in Woodbury, NJ. (Among the odd features–the bathroom adjoined the eat-in kitchen making it. . . uh. . .”interesting” when we had dinner guests. Also, the bathtub hung down into the basement so that someone standing in the basement could actually rap on bottom of it.) The apartment was one of two on our side of a large, old, twin house that had been converted into apartments—two on our side, and three on the other side. The house sat on a on a quiet residential street, lined with tall, stately trees, from which bats, raccoons, and even an occasional flying squirrel would come to visit us—the type of guests you really don’t want to host, especially at 3 AM–whether they use your bathroom or not. Our good friends lived upstairs. Let’s call the man John. That may or may not be his name. John’s mother is Polish. She grew up in a Polish enclave in Philadelphia. My ancestry is Russian-Jewish—all four of my grandparents came from Russia. We both grew up eating borscht. One week we decided to make and compare our versions of borscht. 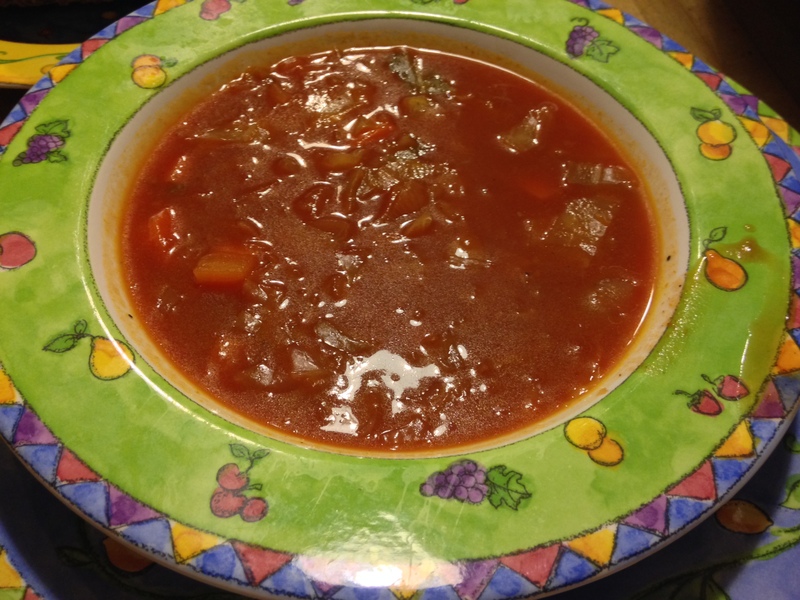 As I recall—and this was close to thirty years ago–John’s borscht was a meaty broth that included large chunks of potatoes and other vegetables. It was much different from my sweet and sour soup, which was more tomatoey and did not include these vegetables, but it was still delicious. I made my borscht the way my mother did. Those familiar with my blog know that my family uses the shitarein method of cooking. That is, we throw in this and that without measuring. 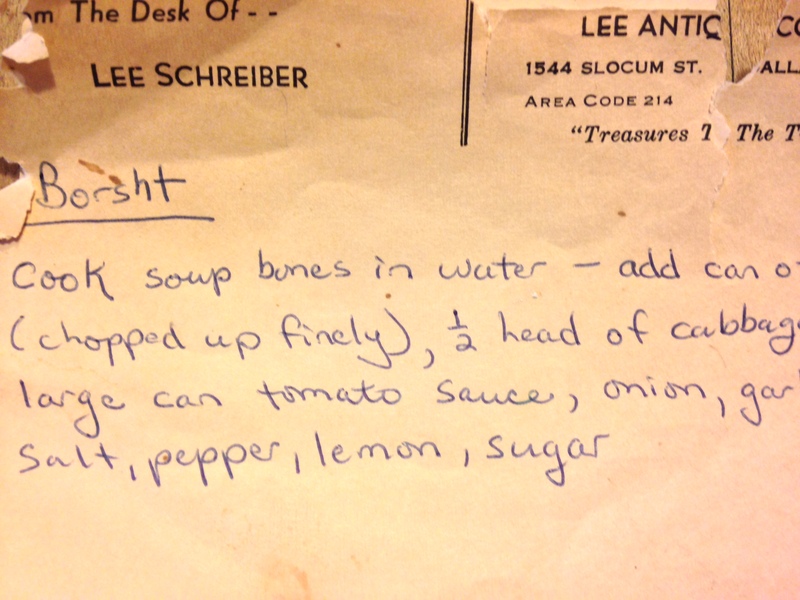 At some point after moving into our first apartment, I must have called my mom to ask her how to make borscht. This is what I wrote down (on old, left over stationary from my parents’ store). You have to understand this is actually my version of what she told me—so it’s sort of a shorthand shitarein “recipe.” I’ve had similar phone conversations with my own daughters. Apparently, it’s genetic. The second borscht memory is also from our BK (before kids) days, but involves another set of friends. We used to sometimes get together with this couple and combine our dinners. I was making borscht one afternoon when the call came. “Want to get together tonight?” “OK. I’m making borscht.” “We’re having spaghetti.” “What time should we be over?” Yup, borscht and spaghetti—a combination that’s hard to forget! We had so much fun though talking and laughing at those dinners—and we all enjoyed eating, of course. The third memory is a recent one, from this past fall. As the weather got cold, my mom was in the mood to make some borscht. Since she can no longer shop on her own, she needed someone to bring her the ingredients. She thought it would be a great idea to have my niece pick up the ingredients on the day before Thanksgiving, when they were going to make the cranberry sauce at my niece’s house for our family dinner (yes, Faithful Readers, for THE squirrel mold). For some reason, my mom could not understand why this idea was less than thrilling to my niece. (What could be more fun after driving with her three kids in the car on the busiest travel day of the year to pick her up?) For one thing, no one at my niece’s house even likes or would eat borscht. For another thing, making the cranberry sauce is always a production in itself. Well, they didn’t make the borscht that night, but the next week, my brother brought my mom the ingredients and she was able to make a pot for herself. So since my head was filled with thoughts of borscht, I decided to make a pot of it yesterday. I make a vegetarian version now. It always seems like such a comforting and nutritious soup—filled with Vitamin C and antioxidants—but more importantly to me, it’s also delicious. I like it a bit spicy, too, which helps to clear my winter-clogged sinuses, so I add ginger and lots of freshly ground pepper. Here is the method. In the best shitarein tradition, you will have to guess at amounts. Come on, cooking is an adventure—at least it is for me. Sometimes I start making one dish, and then halfway through it turns into something else. This time though, I was determined it would be borscht. So here it is. Sauté one large onion; add two chopped carrots, and cook until soft. Add 4 (more or less, depending on their size and your inclination) minced cloves of garlic. Mix in one can finely chopped beets with juice. I use the food processor. If you use fresh beets, I suspect that roasting them first will add sweetness to the mixture. I will try that next time, but the beets at the store didn’t look very good. Add one large can of tomato puree. Then add approximately one qt. of vegetable broth (homemade or purchased). I like Mark Bittman’s One hour vegetable broth recipe, which I follow—more or less. Chop cabbage—I used about ½ a head and add to the pot. Season with lemon juice, brown sugar, ginger (I used a combination of ginger root and ground ginger), salt, and lots of freshly ground pepper. I lost track of the lemons and amount of brown sugar I used. Start with the juice of two lemons, plus some zest if you want and about ¼ cup brown sugar and adjust from there. Remember the adventure. I also added a tablespoon or two of apple cider, because I had some in the refrigerator. So why not? Cook everything until all the vegetables are cooked through. Add more broth if needed. The result should be sweet and sour and a little spicy. If desired, serve with a dollop of sour cream. Borscht is great with black bread. I baked some to go with the soup, using the Smitten Kitchen recipe (omitting the shallot because I didn’t have one.) Really do try this bread. We added some dill Havarti to complete our delicious meal. But now I’m craving spaghetti. Hope you are warm and cozy wherever you are. Thanks for reading! With the start of the new year, our younger daughter moved into her first post-college apartment. I suppose I am now officially an “empty nester,” although I dislike the term. I understand the analogy of the fledgling leaving the nest, but guess what? The nest is not empty—my husband and I are still here! Everyone understands what the term means, but it is a cliché. I will miss having our daughter living here. Yes, she is and will always be my “baby.” I love and adore both my girls. I will miss our fun TV-watching nights when we would chat about friends and catch up—often while eating a special dessert. My husband will miss having her in the car with him on the ride back and forth from work. BUT, just as her sister was, our younger daughter is eager to move on with her “grown up” life. She is happy and in love—and how can I not be happy for her? Neither daughter is now living at home, but they are still in our lives. They will always be my daughters, and I will always be their mother. They are wonderful, talented, kind, smart young women. It is ok to miss their presence in the house. But I am not devastated, I am happy for them, and feel lucky and grateful to have them in my life. Some of my friends no longer have their children. That is devastation. We will still see both of our daughters; we communicate regularly by text and phone. We can SKYPE or do Facetime. It is the end of a stage in all of our lives, but it is also the start of a new one. On New Year’s Day, not knowing when our daughter or her boyfriend were going to arrive at our house before their move the next day, I decided to bake some bread and make a pot of soup. That way, the food would be ready at any time, for whoever wanted it. I decided to make a curried red lentil soup—the golden color symbolizing prosperity in the new year—and the touch of sweetness and the spice added further symbolism, while the touch of coconut milk gave it a bit of creaminess that was perfect for the cold, winter day. I decided to make Honey Wheat Berry Bread. It’s our daughter’s favorite, and I made one loaf for her and one loaf to have with dinner. 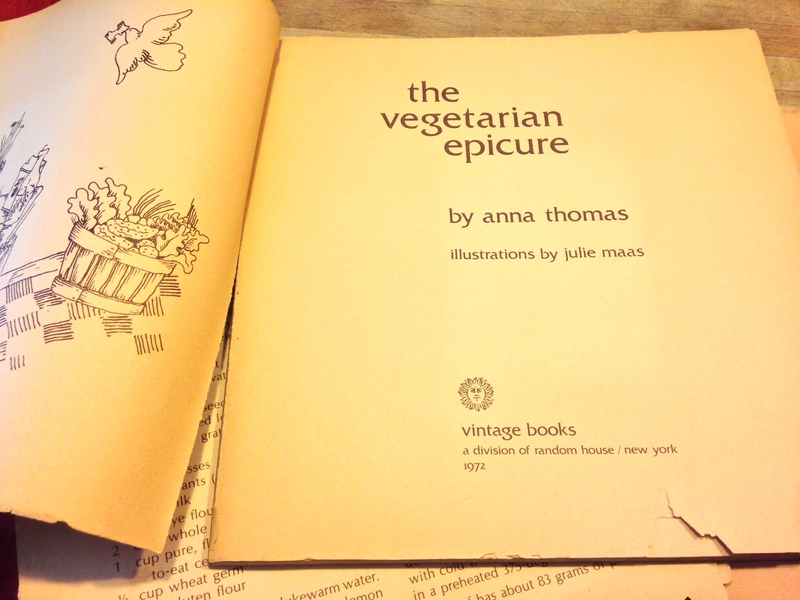 The recipe comes from Anna Thomas’s The Vegetarian Epicure (1972). When I was in high school, a friend—my then boyfriend, now husband’s best friend—gave me this book because he knew I liked to cook. As far as I can recall, it was simply a random present, and I realize now, how kind and thoughtful that was. The book is now tattered and falling apart. 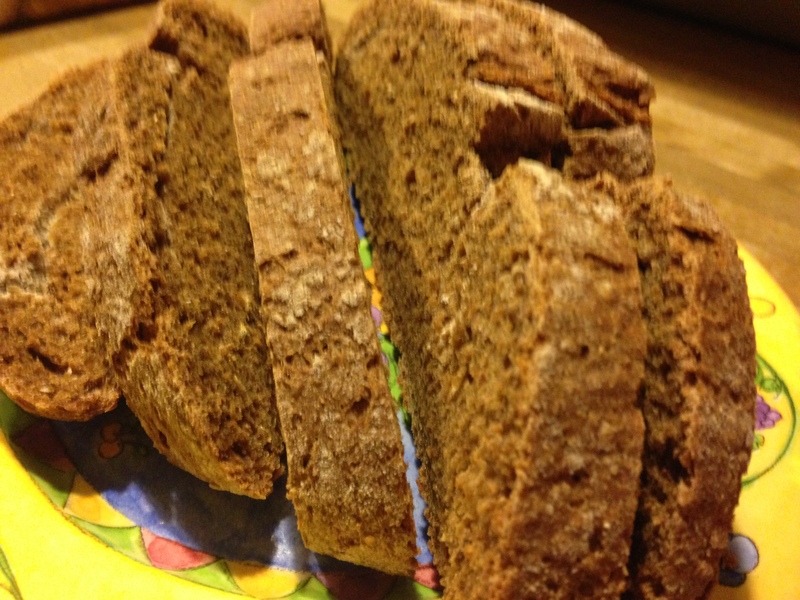 I am fairly certain that the wheat berry bread recipe was the first recipe I made from the book, and that I then presented the friend with a loaf. In those days, it was an adventure trying to find wheat berries. It usually meant a trip to a “health food” store. Now I can find them at my local grocery store. 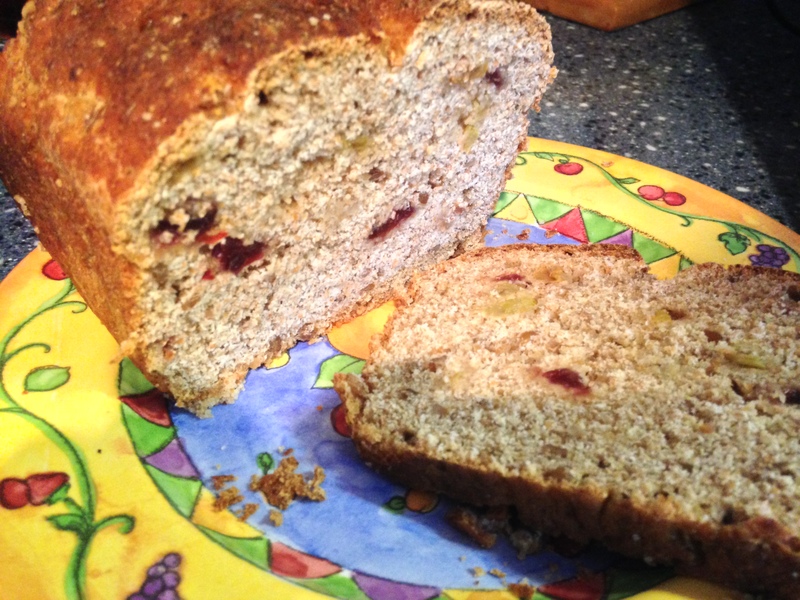 When I made the bread on New Year’s Day, I was inspired by another blogger (check out Shanna Koenigsdorf Wards’ recipe for Spiced Fig and Apple Bread on her blog Curl and Carrots) to add fruit to one loaf, leaving the other loaf plain for my daughter to take to her new apartment. 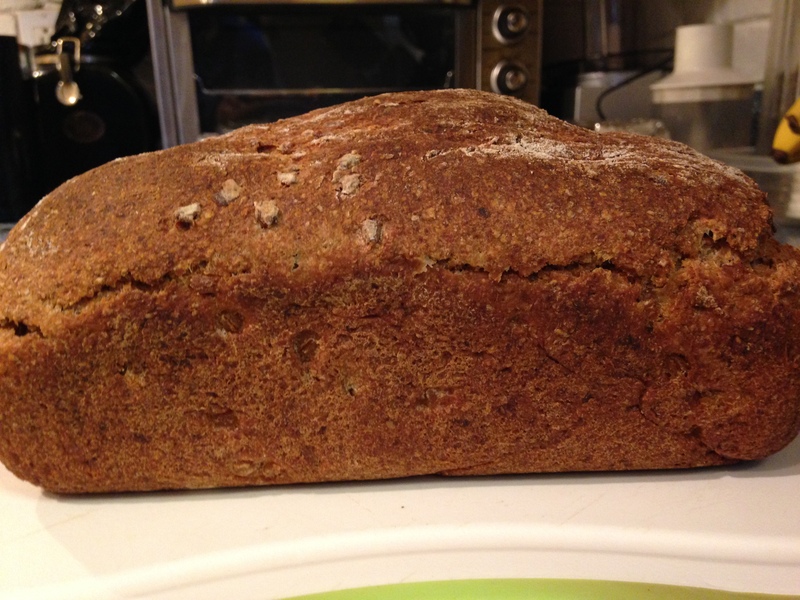 After kneading in the cooked wheat berries to entire amount of dough, I divided the dough into two portions, and added dried cranberries, golden raisins, and about ¼ cup of finely ground walnuts to one loaf. I have to say, it was scrumptious, and delicious with goat cheese! But this bread is even good eaten dry. So my history with this bread began with an old friendship, received inspiration from a new blogger acquaintance, and became a new home gift from mother to child. 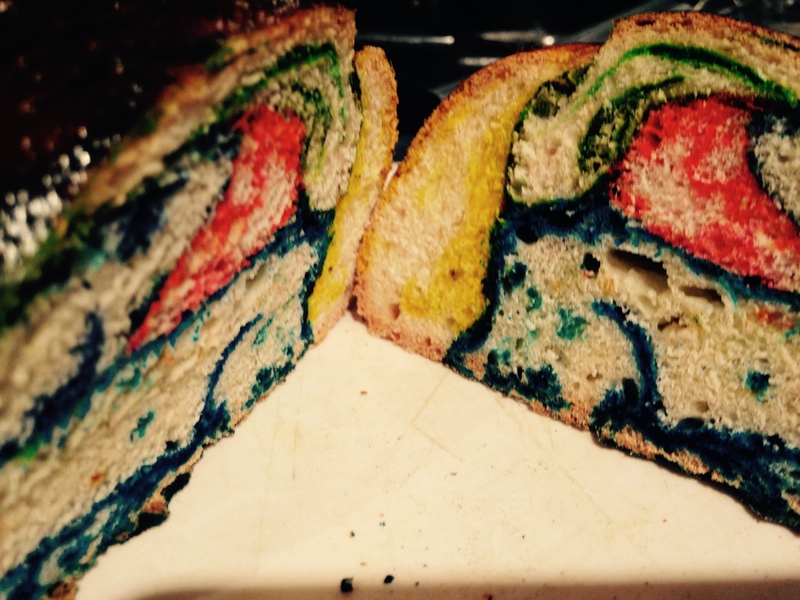 I think I will have to rename it New Year Friendship Bread. And I will have to look up the old friend’s phone number and give him a call! So ring out the old and ring in the new. Let’s see what 2014 has in store for all of us–hopefully, good friends, time with cherished family members, and lots of good bread! Simmer wheat berries in 2 cups water for about 2 ½ to 3 hours, or until the wheat berries are tender. Add water as needed. Wheat berries can be cooked ahead of time and stored in a container in the refrigerator for a couple days. The recipe says to scald the milk and then let it cool to room temperature. I think it’s fine to simply warm the milk. Make certain it is not too hot before adding it to the yeast. Dissolve the yeast in ¼ cup warm water. Add the milk, honey, butter, and salt. Stir in about 4 cups of flour, and mix until smooth. Add more flour and the wheat germ. Knead the dough and place in a greased bowl to rise for about 1 ½ hours until doubled. Punch down, and knead in the cooked wheat berries—and fruit, if using. Divide the dough into two parts, form into loaves, and place in greased loaf pans. Cover and let rise for about 45 minutes. Bake in preheated over at 375° for about 45 minutes. Try not to eat an entire loaf by yourself in one sitting. Yesterday here in the Philadelphia area we had our first real snowfall of the season. The weather forecast was for a bit of snow in the afternoon—I expected maybe an inch over several hours–followed by sleet and freezing rain in the evening. 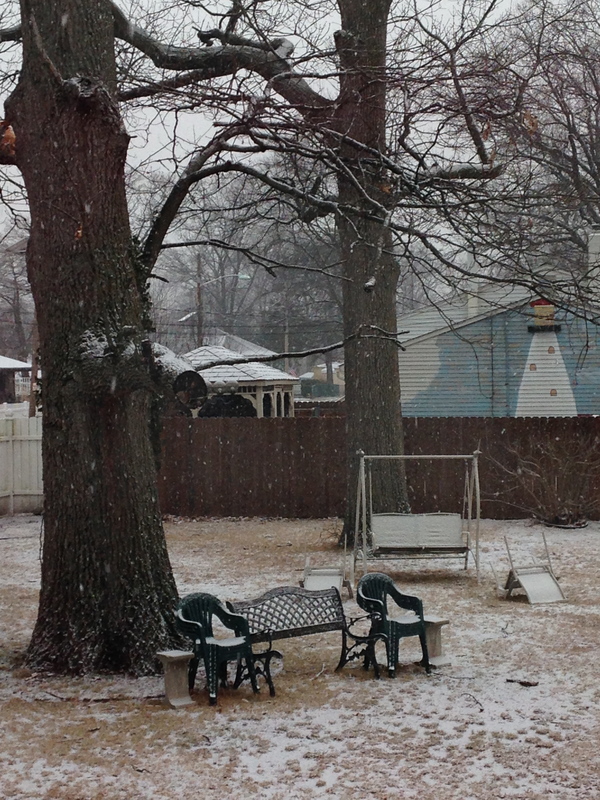 Instead, it began to snow in the late morning and there were several inches on the ground by early afternoon. Total in my town, 8.6 inches. 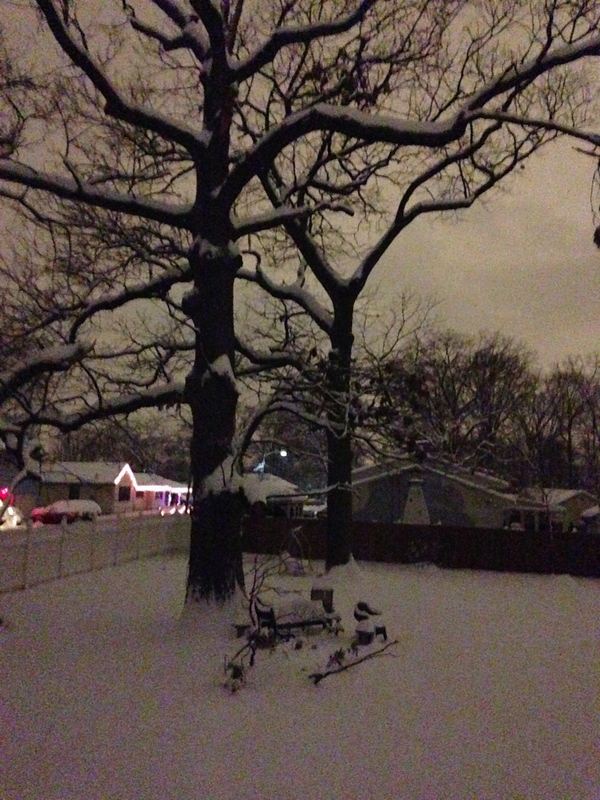 That is not a record snowfall, nor was it any type of epic blizzard, but it was unexpected. Snow is beautiful—if you don’t have to travel in it. The party that my husband and I had planned to attend was cancelled, and we were at home. But our younger daughter was away for the weekend and on her way back to New Jersey as the snow fell and fell. The trip that normally takes her about one and a half to two hours—in heavy traffic—took seven hours. Her first call to my husband came from the Pennsylvania Turnpike. Traffic was backed-up for miles, and she had seen many accidents. She considered getting off at the next exit, but then decided to continue home. My husband and I were listening to traffic reports and looking up her route on our computers and iPhones. Although it was an awful ride for her, it was also horrible waiting and worrying about her. I had intended to work—I have several projects with deadlines looming like. . .hmmm. . .well, like a storm. You know how you hear the weather reports for an upcoming storm? There’s the anticipation, but then suddenly it hits you, and even though you knew it was coming, you’re unprepared. Yup. That’s a deadline. They sneak up on you, and then you’re digging your way out. So anyway, I had all of this work to do, but I couldn’t focus because I was so worried about my daughter. Of course, I did what you’d expect—I baked! Early in the afternoon, I decided to prepare my favorite artisan bread dough. http://www.mybakingaddiction.com/no-knead-pizza-dough-recipe/ . I thought I could either bake bread later or make pizza for dinner. As the hours passed, and our daughter was still on the road, I decided to bake the bread. I had some red lentil soup in the freezer, so I took it out to defrost. Our daughter finally arrived home safely at about 7 PM. She had left Reading, Pennsylvania at noon. She was tired and stressed, but she was safe—and hungry. We sat down to a feast of bread, soup, salad, and cheese. Later we opened some wine. (Red wine and a delicious chocolate truffle from the box a friend brought us. Oh yes, please!) On the plus side, my daughter now knows she can drive a long distance in the snow, and we have delicious food in the house. On the minus side, I still have those deadlines. I better get to work. Well, maybe one cookie first. Beat eggs with whisk, add sugar, oil, vanilla and almond extract and pinch of salt. Stir in dry ingredients. Then stir in chocolate chips and nuts. With oily hands, make 4 “loaves.” I make two each on two cookie sheets. Sprinkle thoroughly with cinnamon and sugar. Bake at 350 degrees for ½ hour. Remove from the oven and slice each loaf. Place slices on the sheet and brown each side in the oven—5-10 minutes for each side. 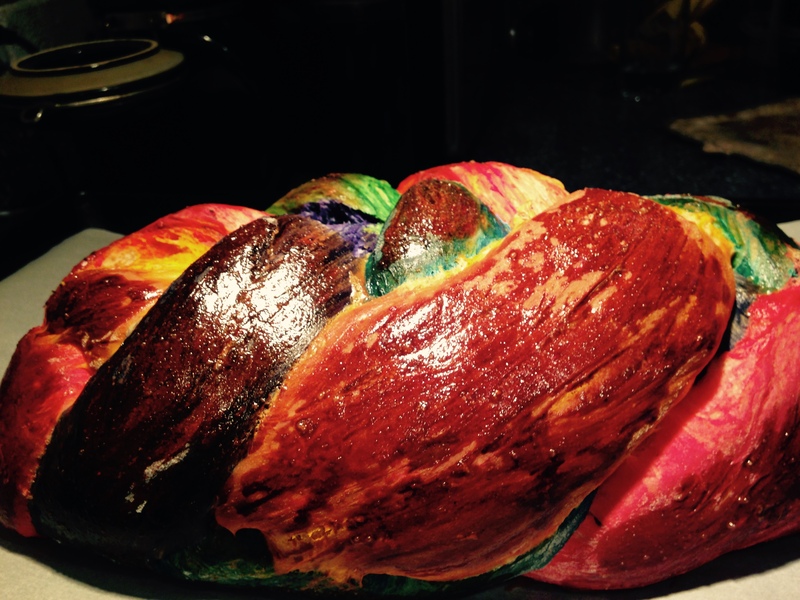 I spent part of the past weekend baking challahs for Rosh Hashanah. Here in the United States, Monday was Labor Day, and many people here consider Labor Day weekend the unofficial end of summer. We’ll be having a small family dinner on Wednesday night, and a big extended family and friends’ meal on Saturday night at our house. In addition to the traditional staples–challahs, apples, and honey–we’ll have pumpkin-yellow split soup, brisket, noodle kugel, and many more luscious dishes–including apple cake, baklava, and maybe something chocolate, too, for dessert. Because chocolate is always appropriate and sometimes necessary. We might even have a kitchen disaster for extra excitement. There will be a variety of dishes to satisfy both meat eaters (did I mention a turkey breast, too, in case someone eats meat, but not beef?) and vegetarians (who needs brisket and turkey breast when there is good bread, soup, kugel, and vegetables? ), and sufficient quantity (see above) to satisfy my own fears that there might not be enough food for everyone to feel totally stuffed and ready to vomit by the end of the meal. There also has to be enough food to send everyone home with leftovers. Yup, I’m not religious, but culturally, I’m the stereotypical Jewish momma, at least when it comes to holiday meals. We had an extra freezer in our basement that broke at the beginning of the summer. I told my husband there was no real necessity to replace it because we don’t really use it that much. Then a couple of weeks ago, I told him in a panic that I needed a freezer to store all the challahs I bake for Rosh Hashanah. True story. It seemed odd at first to be baking and preparing for the holiday on a warm summer afternoon when its seems more of a cool weather fall holiday to me. You might think I could adjust the menu for warmer weather, but then you don’t know my family. We don’t just have food traditions–we worship them. But as I’ve been thinking about the end of summer and the start of fall schedules, the timing of the holiday seems perfect. Here in the United States, most schools have just recently started their fall terms or will soon do so. For my family, it is a fall of new beginnings. Our older daughter started graduate school last week. Our younger daughter just started her first grownup job as a high school English teacher. Since her Dad teaches math in the same school, this job is extra special to them both. It’s a one-semester position, which means they will cherish their temporary carpool and colleague status all the more. During this past weekend, my mother was in the hospital. It appears to be nothing too serious, but her hospitalization is a reminder that she is 91-years-old, and it makes me reflect at this new year on the fleetingness of life and the need to live it to the fullest. (Add resolution to avoid clichés in future writing.) As we dip our apples in the honey this year, I will look at the faces of my family members and friends, and I will consider all the wonderful things in my life and all that makes it sweet—from family and cats to books, TV shows, movies, theatre, and reading the morning newspaper while drinking that first morning cup of coffee. To seeing a beautiful sunrise and feeling satisfied at the end of the day that I accomplished the work I set out to do. To finishing a killer workout at the gym and appreciating that I can still do it. To hearing laughter and to crying tears of joy. As much as I love good food, I love sharing it with family and friends even more. I need to remember to make time for them. I will remind myself to meet my deadlines (oops! ), but to remember to play and laugh, too. I will cherish my family, friends, and my pets. I am thankful for all of you who take the time to read my blog posts. I wish all of you a sweet, healthy, and happy New Year. Don’t forget the honey.